Are you thinking of investing in your children’s future? Well, there are ways that you can do it securely and not risk losing your funds. Just like everything else in life, your best bet lies in making sure that you have done your research. You need to look at the past performance record of any investment you wish to undertake. The performance record should be in a span of not less than 16 years. In this article we are going to look at some of the investments that you should consider. If you do your research well, stocks can offer the kind of investment that is inflation proof compared to other forms of investment. Stock investing is usually only considered high risk when you buy on a short term basis. For example, if you bought stocks at around 2006, then decided to sell at around 2008, most likely you lost money. On the other hand those who bought their stocks at around 2006 and are selling them now, they are definitely getting high returns. You have to remember what a stock means to you. You are buying into the ownership of the company. You have to look at it as your own business that could be affected by several factors. It could be that it is the market that is sluggish. As soon as the market improves, you can be sure to make money. You should also buy into companies that are easy to manage, ones that you can easily tell whether they are doing well or not. That is the only way you can be sure that your research of the past performance of the company is likely to continue. They say past performance is not a guarantee of future performance. However, I consider it a good place to start when looking for red flags. Overall, by the time your children are almost ready to go to college, you should be ready to sell your stocks. If you consult an investment advisor they may offer solid advice on which stocks to be looking at for long term growth, when your kids are older. But if you like the idea of picking them yourself then a service like StockMonitor.com would be useful. You can track your investment portfolio and get a whole suite of tools including their technical analysis stock screener which can show you companies that are in strong trends, or have sold off and may be displaying good value for money. The other factor to keep in mind is that when it comes to investing in stocks, you have to diversify. You need to spread out your investment to multiple companies that are performing very well. There is a great likelihood that some will outperform others. You may even invest in companies that target the same market, but they appear equally strong. Over a period of ten years, it is possible for one of them to dominate the market. If you invested into both of them, you can rest assured your investment decision will pay off. Some companies also offer DRIPs. This is where after you buy stocks, the dividends are reinvested back and your shareholding increases. They are great when you want to save for your children’s future but also teach them how to invest in stocks. When they keep seeing their shareholding increasing each year, they will appreciate the importance of investing in stocks. Bonds are a form of temporary shareholding. You simply buy them for a specified period of time. Unlike regular stocks where you can hold onto them for as long as you want, bonds are a form of IOU. You are lending money to a government or an institution so you can get it back with interest. They offer a lower risk but at lower interest rates. They are less favored compared to stocks. This is another great way to diversify the investment in your children’s future. It involves paying their college tuition using the current rates. Many States allow you to do that and the tuition fees is transferable to other colleges in other States. It is a great way for you to secure your children’s education. Many people say they have never heard of this option but is is a great way save what you have in your child’s future education. This is a form of stock ownership that allows you to let a mutual fund organization invest on your behalf. It is worth noting they charge you extra for that service and you need to factor that in your investment. They basically invest in several companies that they consider to be performing well. They allow you to own a portion of those companies through them. If you do not have time doing your own investment research, they offer a better investment option. Those are among the top best options that give you great control both in investment and securing your child’s education and financial future. We hope that you have learned something and you will build on that to make informed investment decisions for your children’s future. Obtaining and maintaining credit is an essential part of modern life. If you are one of the many students who will apply for student loans, you need to be aware that borrowing wisely and managing your financial obligations are your responsibility. So it may be helpful to obtain a copy of your credit bureau report. It’s easy and may be offered for free. While federal student loans are generally available to students regardless of credit, private loan interest rates and fees will depend a great deal on your credit score, so keep this in mind when applying for private loans. Try to pay off your credit card debt before you enroll in order to reduce your monthly expenses. Consider enrolling in a monthly payment plan instead of using your credit card for your student account. Use the card for emergencies, not for routine living or as a convenience. Remember that late charges and finance charges dramatically increase your credit card debt. Don’t play the revolving credit card game, using a new card to pay off existing credit card debt. Your credit card debt will be used to calculate your debt-to-income ratio and may make you ineligible for some private loans. If you are late in making payments, it will impact your credit rating. You may be denied education or consumer loans, and later on in life, you may not be able to obtain a mortgage or even have the ability to rent an apartment if you make late credit card payments. Always try to pay off the balance at the end of each month. If you’re unsure of the status of your credit history, you can order and review your personal credit report. Credit reports will include information on your credit cards and consumer accounts, even inactive ones. Any federal student loan information will also be contained in the report. It is essential to teach your kids about money. 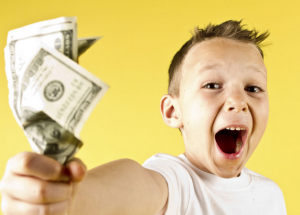 You may think that it won’t be right for you to acquaint your kids with money. But, this is a wrong conception and some amount of exposure to money can actually help your kids grow up as a responsible human being. Money is one of the most crucial things for our living other than air and water. It helps us in obtaining all those in our life that we require starting from clothing to foods. So, it is important to learn about money form a young age. 1. Provide them a small allowance – You can start proving your child with a small allowance on a daily, weekly or monthly basis. Calculate how much your kid needs for a day or week or maybe a month and give them an amount slightly above than what they need. Ask them to save the extra amount. 2. Take them to the bank – You can take along your kids to the bank while going there for some work. Explain to your kids the importance and the services provided by the bank in simple terms. This may help in growing some kind of interest in your kids. 3. Gift them a piggy bank – As has been discussed in the first point, you can ask your kids to start saving. Now, in order to help your kids save money gift them a piggy bank that is cute and attractive. Talk to them about the importance of saving. You can even work on this by telling them that you don’t have the money in hand to buy them a particular thing they have been wanting. You would need to get the money from the bank or your savings account. This will help your kid in understanding the importance of saving. 4. Let them count money – In order to acquaint your kids properly with money you can let your kids count money. For example, if you find out that you have some coins in hand, you can give that to your kids and ask them to count the same and tell you the exact amount that it is amounting to. 5. Ask them to make a spending plan – In addition to ask your kids to save money, you can also ask them to make a spending plan and then spend the money only according to the spending plan. 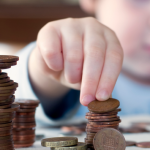 This can help your kids learn budgeting from an early age. This will also help them to better understand how the money should be used. So, you can see that a little allowance and all of the above discussed ideas can help you in teaching your kids about money without over exposing them. This can actually help your children learn the actual value of money. Work ethic. Some argue that giving cash rewards for good grades is a great way to instill work ethic in children from early-on. After all, when they leave school and start a career, they will be paid for a job well done. Incentive. Let’s face it: some children just don’t have the natural propensity to enjoy schoolwork. If your child struggles with the thought of committing to and developing enthusiasm for educational obligations, then money may be the incentive needed to get out of that rut. Real-life equivalence. Life is full of rewards and punishments. Teaching children that hard work and accomplishment comes with rewards is not necessarily a bad thing. External versus internal satisfaction. Many opponents of the cash-for-grades method argue that making good grades should be a fulfilling experience in itself. Children should learn a love for achievement, based on the satisfaction of setting a goal, working hard to reach that goal, and then accomplishing that goal – no external payoff required. Entitlement. It may be unhealthy to reward children for doing things that they should do no matter what. If you give your children money for grades, what’s next? Paying them to be nice to others? Un-academic children. Some children struggle in school for very legitimate reasons. Children who have learning disabilities may find it difficult (or impossible) to bring home straight-A report cards, and the cash reward for good grades may feel like an unattainable carrot dangling in front of their faces and a constant reminder of their struggles. All children are different, and what works for one may not work for another. There is no definitive answer to the question of giving money for grades, but a good, hard look at the possible pros and cons should help you arrive at a conclusion that is best-suited to your family. There are so many different investments you can make on behalf of your children. You can buy property, or stocks, even precious metals and art. Depending on your knowledge and appetite for risk, the choice you make will be far different from one another might make. Here are some of the pros and cons of some of the main ways to invest. Investing in property is always a good idea, even if only buying your own home. While the market will sway from time to time, property prices will always bounce back because quite simply the population is always growing. This is always the case if you buy in a desirable area. Buying property can be an investment for your kids in future years. You may have to deal with rentals in the meantime, but over a 10 or 20 year period, property should always be a reasonably safe bet, as long as you buy a good one! Remember location is everything. Buying Gold or Silver is a good way to invest your money for growth, but you have to time your purchases right. You can buy bullion and have it stored, you could buy Gold or Silver coins, or slightly more complex you could buy shares in Gold mining companies. The trick with buying Gold or Silver is to watch long term trends in the price of these metals. Investing with a long term view when prices are near multi year lows, can often work out good. Similarly with investing in Gold mining stocks, to invest only in the largest and most established miners you can buy the GDX ETF, which is a tracker of the top Gold mining stocks on the exchanges. It is a risky game, but investing in shares can reap great rewards over a long term. The trick is to spread your investment over a few large companies that offer dividends, and not to jump in immediately! Timing is everything on the stock market. If you plan to invest in shares for your children, then wait for the best opportunity. Watch share prices, and keep an eye on financial news. If the market is selling off, and there is fear in the markets, then when this extends for a long period, it can offer a great entry into bell weather stocks for a long term view. It’s called buying a dip. It’s the best place to buy, you certainly do not want to buy the top! Make use of free websites online and start tracking share prices of some major companies. Get to know their highs and lows, because buying near a low will offer you a better reward than buying near a high.